Perfect to make a comforting and delightful dish of stuffed pasta…try them with spinach and ricotta! Cannelloni are rectangular sheets of pasta that are enfolded in a cylindrical shape and then stuffed. 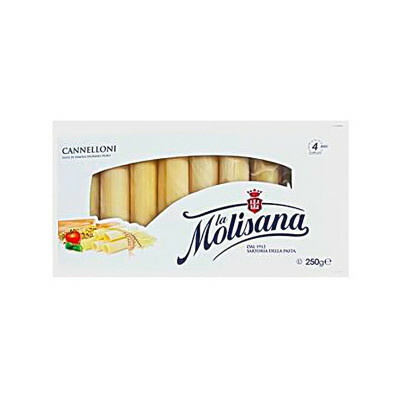 This cylindrical kind of pasta is usually filled with savoury stuffing, which might include ricotta, spinach or different kinds of meat. Afterwards, the dish is covered with sauce. The naming probably derives from cane. The cannelloni are mentioned for the first time in a text in the early twentieth century. Their popularity grew after World War II. Durum wheat semolina pasta. MAY CONTAIN TRACES OF EGG. 1 Year. Store in a cool, dry place.